Join in one our fun workshops this Easter. Calling all mad hatters! Make a bonkers Easter bonnet or a crazy-cool top hat. Wear it to the Easter Bonnet Competition and Duck Race in Bradford on Avon on Easter Monday to win prizes! In this workshop we’ll show you how to make from scratch a seriously cool hat that will look like it’s made by a top milliner. Make your headwear as cute, cool or crazy as you are. Make a classic boater to turn into an Easter bonnet, an elegant top hat, or a mad, bad and bonkers steampunk style creation. Youth & Community Centre, Wednesday 12th April – two separate workshops, book either 10am til noon or 2pm til 4pm. 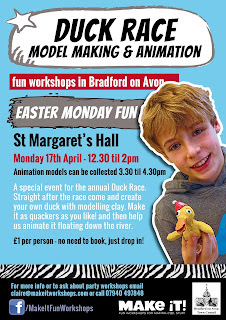 £10 per person – please book your place in advance at the Bradford on Avon Tourist Info Centre. A special event for the annual Duck Race. 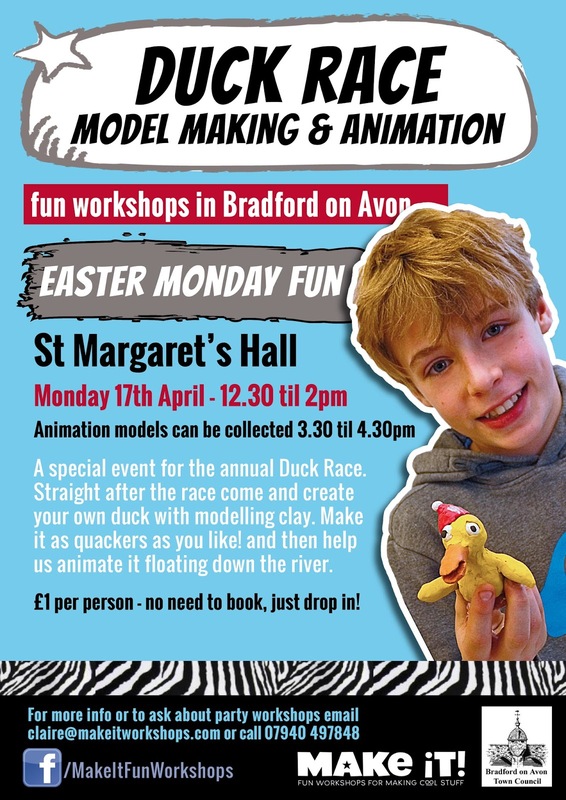 Straight after the race come and create your own duck with modelling clay. Make it as quackers as you like! and then help us animate it floating down the river. St Margaret’s Hall, Monday 17th April – 12.30 til 2pm. Animation models can be collected 3.30 til 4.30pm. £1 per person – no need to book, just drop in! Youngsters 8 years or under must be accompanied by an adult.